Tai Chi is first and foremost a martial art, but it is just as important for you to be aware of some of the amazing health benefits associated with this ancient practice. There is no easy path to health and relaxation. The only way to get there is through daily effort, and in the end you alone are responsible for getting there. Great teachers are important. They can give you amazing insights and help point you in the right direction, but the real question is: What will you do with all of that great instruction? Will you use it to change your life? I really hope so. It’s not enough to just take a Tai Chi class (or any exercise for that matter) once or twice a week and expect that your health will change for the better. Stress never takes a break. It is present in our lives every day; it doesn’t discriminate and it doesn’t care if you’re young or old. Stress is the #1 killer and is linked to at least six leading causes of death: cancer, heart disease, suicide, lung ailments, cirrhosis of the liver, and accidents. Because stress never takes a break, neither should you. Be diligent in your Tai Chi practice, constantly remembering to relax the mind and body in everything that you do, and as often as possible. Act like your life depends on it — because it does. Disease never takes a break. Disease is always at work. Just like rust, it never stops. And just like stress, disease also does not discriminate or care who you are. If you are suffering from a disease, any disease, you will need to put as much effort into the health of your body as the disease does for the destruction of it. Make no mistake about it, it is a fight, and maybe it’s the fight of your life. You have to decide in your heart and mind that you are going to win, and we know that the only way to win is to be in the fight. This Tai Chi Stretch and Warm-Up exercise created by Sifu Michael Paler became a huge part of his own recovery. Did you know that the definition of the word Kung Fu literally means a skill acquired through time and effort? We challenge you to practice our Tai Chi Stretch and Warm-Up for 100 days and see for yourself the difference that daily Tai Chi practice makes for you. 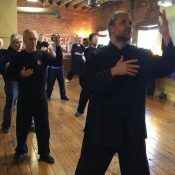 In our Tai Chi classes, we sometimes hear Sifu Michael Paler say “There ain’t nothin’ to it, but to do it.” Michael understands how hard it can be to change yourself, but if you are desperate enough, like he was, you will. He teaches his students by using his own personal experiences. Michael, today an accomplished martial artist, came from a family of boxers. His grandfather was a Golden Glove boxer; his father was also a boxer. Like his grandfather and father before him, Michael himself was a boxer. When he eventually left New York having had more fights and violent confrontations than he cares to remember, he found himself having to deal with quite a few injuries as a result of both his boxing and previous lifestyle. These injuries included muscular and skeletal damage to his head, neck, and spine with two fractured vertebrae, C3 & C5, in his neck. He also suffered from some severe PTSD issues as well. Add to these injuries and issues more than a few car accidents, a 15ft fall off a waterfall, landing squarely on his cheekbone on a slate surface, and spinal meningitis as a child. So, you can see why Michael seriously needed a lifestyle change in order to heal his body and mind. Back then, he didn’t have medical insurance to see a doctor for his injuries or get a prescription for drugs that could have helped him deal with the constant pain. Michael knew that his only option was to take the lead himself in his own recovery; he had to be willing to do the work. I share all this with you not so you would feel sorry for Michael that he came from such humble beginnings, or had to deal with such severe injuries, but only to encourage you and to help you understand that you can change almost any situation if you put your heart and mind to it. Through much prayer and daily work, Michael targeted each and every injury head on. With daily practice, Michael was able to repair much of the damage that had been done to his head, neck, and spine. He achieved this not only by applying Yang Cheng Fu’s 10 essential principles of Tai Chi to his daily forms practice, but also by applying these principles to his movements in everyday life. Everywhere he went, whether standing in line at the grocery store, taking a hike with his dogs, driving a car, and even when sitting on the couch watching TV, he was always practicing these principles — and, FYI, he has never stopped. In time, Michael started noticing significant improvements in his alignment, power, and even in his skeletal structure. These improvements affected the way he stood, moved, and how his weight transferred down through his body to his feet and into the ground. When these changes began to happen, he also noticed a huge improvement in the constant pain he had lived with for so long, decreasing from an 8 or 9 to a 2, and sometimes even less, on the pain chart. This was a real breakthrough for Michael and gave him the strength and resolve to keep on going. Tai Chi taught Michael how to create real and lasting relaxation by changing the way his central nervous system reacted to stress, helping greatly with his PTSD. He taught himself how to release tension and relax the nerves through the fascia (read more about the fascia here) — basically retraining and rewiring his own body in the process. We all hold some amount of trauma in our bodies because of things that have happened to us throughout our lives. Some of us never get over them unless we face our issues head on and learn to deal with them like Michael did. He realized that there was no easy way though the pain and “dis-ease” and understood it was going to take all of his fighting spirit to beat these things in order to be whole again. If you want to get better, it will require the same kind of effort from you. So, do your warm-up and practice your form every day and make sure you are applying the principles to each and every movement — because that’s where the magic happens. Doing Tai Chi without using the principles is like making a delicious healthy meal without eating it. Always move slowly and with purpose. Remember you are teaching your body something new, creating muscle memory and changing old habits you may have held on to your entire life. Tai Chi is a mind/body exercise. This means your mind and your body are learning and working together at the same time. The only way to teach your body new things is through feeling and movement. I can’t begin to tell you how many times I have seen people in a Tai Chi class just standing there listening and watching Michael move, but not moving themselves. I have heard Michael say to them, “You have to move your body. It’s not enough to just think about relaxation. You have to create relaxation. You have to feel it inside your body, so that you can recreate it again and again until it becomes natural for you, until it becomes something you don’t have to think about anymore — like breathing.” Some people will hear this teaching and put it to good use, but, unfortunately, some will not. 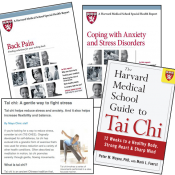 Peter M. Wayne, PhD., of Harvard Medical School wrote a book, The Harvard Medical School Guide to Tai Chi. The benefits of Tai Chi are too many to even list here. This book is wonderful and inspiring. It is filled with medical research and tests that prove without a doubt that Tai Chi — when applied — works. But unless you actually do the work, you will never ever receive the health benefits of it. 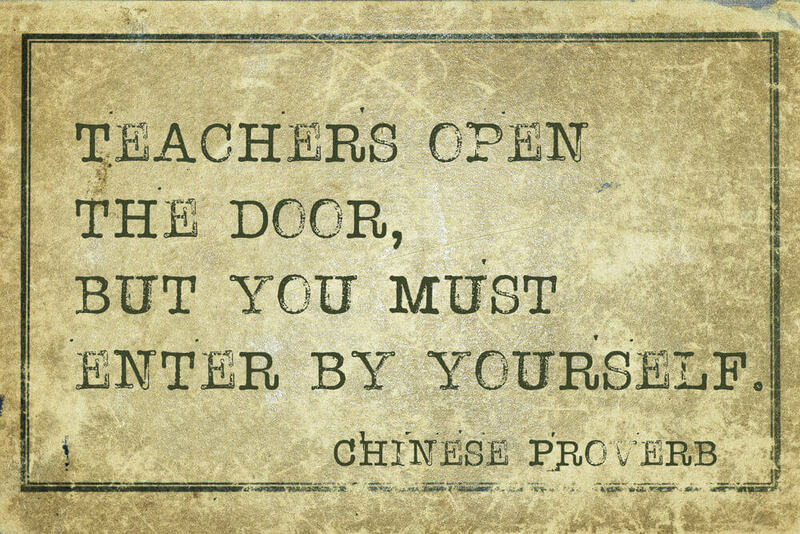 Never forget: Teachers open the door, but you must enter by yourself. That is an amazing story and so true. When Michael walks in to start our class, you can feel the respect and love we all have for him by the immediate silence in the room. He shares his knowledge in a different way during the warmup in every class which is so helpful, and his focus on helping with an individual problem is incredible. I am so grateful to have been introduced to his Tai Chi classes, and having him guide me to live a better life. I posted this on Facebook and will post it here as well. I saw this right after making the following note in my journal. “Tai Chi is a self-healing modality that also allows me to experience the interconnectedness and grand design of life.” Sometimes therapy is exactly what we need – but at a certain point the focus of getting out of pain or ill health becomes unsatisfying. At least it did for me. So finding things that allow me to heal as I reach for the stars is critical for my soul.